Apparently in response to that claim, on the following day a woman involved in training in Signals Intelligence Compliance and Oversight (what the NSA calls SV) wrote up an exchange she had with Snowden a year earlier. (PDF 147) Here’s how that email appeared on April 10, after at least one draft. The individual appeared at the side of my desk in the SV training area during the timeframe between 5 – 12 April 2013, shortly after lunch time. He did not introduce himself and instead asked if he could talk to someone about the OVSC1203 [Section 702] course. I indicated that he could talk to me. He seemed upset and proceeded to say that he had tried to take OVSC1203 and that he had failed. He then commented that he felt we had trick questions throughout the course content that made him fail. SV Training has standard (canned) responses we use to respond to questions like this. I introduced myself and provided the information to him. My comments were standard and part of our “canned” responses, and informed him that the OVSC courses did not contain any trick questions and that all of the answers to the test questions could be located within the course content (our standard response when someone states they have failed any of our courses). Also, as part of our standard response with this type of question, we remind the student that the course is open book and not timed, also part of our routine canned response. I also reminded him that students receive multiple attempts to successfully pass the course and if they are not successful after multiple attempts he would need to contact us for further assistance. He seemed to have calmed down by then and said he still thought the questions tricked the students but he would try again. On May 29, 2014, first Dianne Feinstein (there’s evidence she was prodded by someone at NSA or ODNI) released Snowden’s email exchange with OGC, then NSA formally released it. Today’s release is incomplete, and does not include my correspondence with the Signals Intelligence Directorate’s Office of Compliance, which believed that a classified executive order could take precedence over an act of Congress, contradicting what was just published. It also did not include concerns about how indefensible collection activities – such as breaking into the back-haul communications of major US internet companies – are sometimes concealed under E.O. 12333 to avoid Congressional reporting requirements and regulations. About an hour and a half after Feinstein had released Snowden’s email on May 29 but before WaPo published Snowden’s claim, the Media Leaks Task Force discovered the write-up of the SV exchange from April, but did not release it publicly (meaning when Snowden made his claim, he did not know they had written up the exchange). Around, or even before that, OGC realized that some of the discussions they were having would have to be turned over in response to this FOIA, and then-General Counsel Raj De “ask[ed] that no one else comment on the low-side [less secure] (or add additional folks to the e-mail exchange),” (PDF 148), so it’s not clear subsequent discussions about this exchange got released in the FOIA. Later that day, “the accountable NSA official for Media Disclosures issues” wrote Admiral Rogers a pretty remarkable apology for not providing sufficient context about Snowden’s interactions. (PDF 96) It’s remarkable that it happened — kudos to Admiral Rogers for trying to get clarity on this issue. But it’s remarkable, too, because even after the two day fact-checking process, the apology endeavoring to keep NSA leadership fully informed did not do so. That claim appears to be erroneous on two counts. First, SV had already reported at least the OGC exchange before the Agency All email went out. Attachment B in the apology to Rogers is a screen cap of the website version of the Agency All request for details on interactions with Snowden. Here’s another data point on the Snowden situation. If you have a POC you’d prefer I send these to, please let me know. The reference to “another data point” suggests Chief SV had already provided Ensor one data point (which could well be the face-to-face exchange), but we received no record of that having been made in writing. The third exchange involving SV, when Snowden helped troubleshoot a technical problem in August 2012, did get reported in response to the Agency All email; the person forwarded the exchange internally to SV colleagues (though note, this email likely also has its metadata reflecting who was party to it screwed up) at 12:06PM, (PDF 135) and SV Chief forwarded it to the Chief, Compromise Investigations Branch, the contact listed on the Agency All email, at 12:51PM (PDF 192). In that email, SV Chief did not mention that one or two data points, including one email, had already been sent to Ensor. Note that, on May 29 when the face-to-face contact was discovered again, a Special Agent in Counterintelligence said that contact was “news to me” (PDF 230), so it appears that face-to-face contact did not get reported (at least in written form) to the people who spent the next year researching Snowden’s contacts. This part of the error in the apology may be fairly innocuous (indeed, it suggests SV was proactive about these contacts with Snowden). But the fact that SV reported them before any order to do so shows they believed they were (or it was) fairly significant. The other error seems more problematic, however. After two days of having very senior NSA people fact-checking, the person apologizing to Admiral Rogers for not providing sufficient context stated that the SV training woman had written up both exchanges “in response to the June 2013 Agency All.” The SV training woman did provide the emails involved in the OGC exchange on June 10 (though again, before the Agency All went out). But the evidence shows that she wrote up the face-to-face exchange in response to Snowden claiming he had had exchanges with oversight and compliance a year later. If, as the evidence suggests, that email was written only after Snowden made public claims that the communication existed, Rogers surely should have been told that. Given all this evidence, my guess is that the truth lies somewhere in-between NSA’s claims about that face-to-face contact (not least because there is little chance Snowden, who was on his way out the door, would really have been distressed about failing an open book test) and what Snowden claimed in 2014. It may well have happened in the context of a discussion about 702 training, but there are plenty of loopholes in 702 to believe that SV told Snowden that there were ways around the spirit of the law (as they said in training on the Section 215 dragnet, which advised analysts to rerun queries under 12333 to be able to disseminate them more widely). If Snowden got SV to confirm that it endorsed those loopholes, however, it would constitute an example where it endorsed an EO trumping the law, in spirit though not necessarily in law. Leopold and I tried to get some clarity on what happened between Snowden and SV in April 2013, but neither side wanted to explain it. We asked Snowden specific questions about what training he had taken and when, whether he had really failed, what other emails, in addition to the two from OGC that he kept in a separate folder, he had saved, among other questions. He declined to cooperate in our story. We gave the NSA questions a week ago Tuesday. Among other things, we asked whether there was a contemporaneous record of the SV to Snowden contact, what the “other data point” referred to by the SV Chief might be, whether we could have all the emails the SV training woman forwarded to her supervisors, whether we could have the drafts of her email describing her interaction with Snowden (of which at least one exists), and whether we could have the emails between the 7 people deciding who and how would respond to Snowden; I believe at least some of these things are responsive to Leopold’s FOIA. As late as Friday afternoon, when NSA explained the metadata problems with its FOIA response, they said they might have a response for us. Then, at 11:40 PM, they released all the emails, which we took as an attempt to pre-empt our story, which led to a frantic effort from editors to pull the story together to release that day (the tactic probably would have worked better if both Leopold and his editor weren’t in CA). Which is why I’m so interested in what NSA said after spending several days at least considering answering questions about what happened between Snowden and SV. As part of its response to Snowden’s claims in May 2014, NSA developed a Q&A document (starting at PDF 516; see PDF 522-523) that made this claim about Snowden’s efforts to raise issues internally (they gave a hilariously abbreviated version of this to us as their only official comment for the story, as if we hadn’t seen how they edited it along the way to limit their claims about what was in place when Snowden was at the agency). It included these statements summarizing what they had found from Snowden. NSA is unaware of any correspondence Edward Snowden had with the NSA Inspector General, the Office of General Counsel, or his supervisors wherein he expressed constitutional concerns about NSA’s intelligence operations or authorities. We have found one instance of an e-mail inquiry to the office of General Counsel asking for an explanation of the content of some training material. We have located additional email between Snowden and members of Office of General Counsel and Oversight and Compliance relating to his job duties and work on troubleshooting IT issues, but these emails do not contain any questions or concerns about the legal authorities under which NSA operates. Here’s what NSA said in their cover letter accompanying the public email release around midnight Friday. Today the National Security Agency (NSA) is making public more than 200 documents it recently released under the Freedom of Information Act. The documents illustrate that, as the Agency reported in May 2014, NSA conducted a thorough search of e-mail and has no records of any e-mail from former NSA contractor Edward Snowden to Agency officials raising concerns about NSA programs. 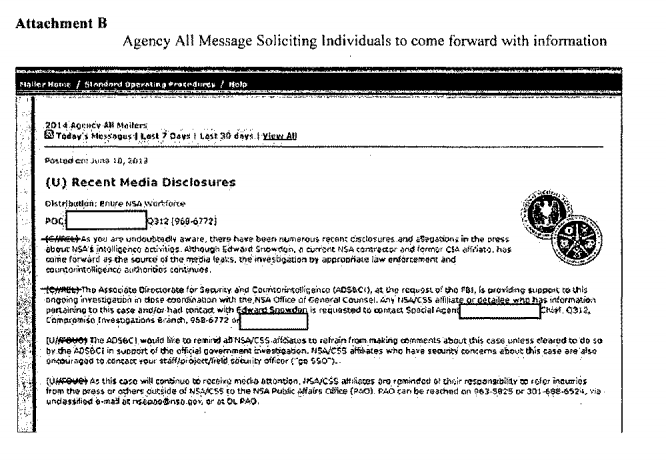 The documents posted today reveal the details of the Agency’s many efforts to locate the alleged e-mail. Despite an exhaustive search that included looking for all of Mr. Snowden’s e-mail available on NSA systems and in NSA’s email repositories, the Agency has no record that he submitted complaints to senior NSA leadership – including the NSA Director, Deputy Director, and Executive Director. In addition, the Agency does not have any records that he submitted any complaints to the NSA Inspector General or the General Counsel challenging NSA programs. On May 29, 2014, NSA publicly released one e-mail inquiry from Mr. Snowden, as well as the accompanying response from NSA’s Office of General Counsel. The e-mail did not raise allegations or concerns about wrongdoing or abuse. It posed a legal question that the Office of General Counsel addressed. There was no additional follow-up noted. Let’s start with the final paragraph, which is a comment about what NSA said in May 2014 regarding its Snowden release. “There was no follow-up noted.” That’s different from saying, “NSA has found no records of follow-up,” which would be pertinent response to the question of whether NSA has since determined the interaction with the SV woman — which, again, may have happened on one of the same days as she had a role in fielding the OGC question — was or may have been part of the exchange with OGC. Finally, I’m interested in the slightly altered claims about what Snowden said to OGC. Even out of context, his initial question had to have pertained to whether EO 12333 could trump FISA (I FOIAed the actual training course in question but NSA rather bizarrely either did not treat that as a FOIA pertaining to these issues or did not treat me as a journalist and it remains unfulfilled.) That’s a concern about a legal authority, but it’s not a concern about specific programs (the USSID-18 training would apply across the board at NSA, not to specific programs, though the 702 training obviously pertains to one authority). Again, I can’t say what happened either in the face-to-face encounter between Snowden and the SV training woman, or what happened with SV’s response to requests for information on encounters with Snowden. No one wants to talk about it. But I do find it interesting that NSA was happy to address the issue until we posed questions that would get to what really happened. Update: Records show 7 people were involved in the response to Snowden: the SV woman, her supervisors, someone else at SV, two OGC lawyers, and the OGC Chief of Staff. But Rogers would only have seen the involvement of 6 of them, as (per the SV woman’s description of events) she did not receive a copy of OGC’s response to Snowden directly. This post has been corrected accordingly. Too funny. Public relations is one thing, substance quite another. You know you’re getting close when answers are harder to get. Nice work. This is the NSA. They are paid to lie through their teeth. They lie through their teeth to your face. Did the OGC and other officials spend the weekend or just Monday morning formulating an answer for Snowden? I cannot locate the timestamp for OGC’s attempt to reroute Snowden’s questions to SV and the SV’s subsequent re-forwarding of Snowden’s questions back to the OGC for comment. Guessing at a timeline, I assume Snowden had a conversation with the woman at SV on Friday April 5, 2013. Subsequent to that conversation (‘no trick questions. Answers are in your study book’) Snowden emailed OGC. Curious why Snowden and NSA both are reluctant to discuss the timeline in public. Because this story seems to have updates every spring, I’m including the following just for clarification. Snowden’s email April 05, 2013 is the one in which he points out that the NSA training course he took had a misleading hierarchy of authorities– with EOs seemingly on level with federal law. Executive Orders (E.O.s) have the “force and effect of law.” That said, you are correct that E.0.s cannot override a statute. In general, DOD and ODNI regulations are afforded similar precedence though subject matter or date could result in one having precedence over another. Please give me a call if you would like to discuss further. How does NSA come up with this abbreviation for “Signals Intelligence Compliance and Oversight” training group? “Signals Intelligence Compliance and Oversight” is five words, and five is “V” in Roman numbering? So a five word title beginning with S equals SV. Which would be a weird system but nothing about the NSA seems remotely rational anyway.